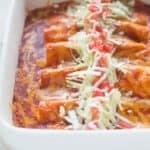 The BEST homemade Cheese Enchiladas! Our favorite authentic cheese enchiladas are easy, fast and insanely delicious! Warm corn tortillas on a hot skillet for a few seconds in each side. Pour 1/4 cup of the enchilada sauce into the bottom of a 9x13'' pan. Fill each corn tortilla with a handful of cheese (reserving about 1/2 cup for sprinkling over the top, at the end). Roll tightly, and place seam side down in the pan. Pour remaining enchilada sauce over the top. Top with remaining 1/2 cup of cheese. Bake for 20-25 minutes or until hot and bubbly. Remove from oven and top with shredded cabbage, cotija cheese, tomatoes, and sour cream. Serve with one of my favorite Mexican side dishes.